Interfaith – every day's a holiday! A priest, a rabbi, and two ministers set out to sea to fight the Nazis. This is not a joke, but the beginning of a sad but inspiring story of four chaplains who are remembered today as, aptly, the Four Chaplains. George Fox was the eldest, a 42 year-old WWI veteran who had become a Methodist Minister at age 34. He joined the Army Chaplain Service the same day his teenage son joined the Marines. The fourth chaplain was Father John Washington. As an Irish Catholic Priest, he was the only unmarried, childless chaplain of the four. He grew up in a poor immigrant family and was even in a gang as a youth, but received a calling from God, and was ordained in 1935. The bespectacled Washington joined Fox, Goode, and Poling at the Harvard Chaplain School, and the four developed a strong friendship. In January, 1943 they boarded the U.S.A.T. Dorchester bound for Europe. With over 900 passengers, mostly soldiers and few civilians, the ship was 150 miles from Greenland when it entered the waters known as “torpedo junction”. During the voyage, the four worked together to ease the fears of the men. Priest, Minister, and Rabbi offered prayers to soldiers of all faiths, not just their own. The evening of February 2, the Captain instructed the soldiers to wear their life vests. Most however didn’t take the warning to heart. On February 3, the Dorchester was struck by a German torpedo, killing about 100 men instantly. The ship began sinking in minutes. In the chaos, most lifeboats floated away or capsized. 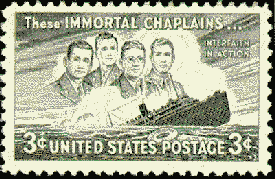 The four chaplains directed the men, urged hope, established a sense of order, and helped men into the lifeboats. When the lifeboats were gone, the four chaplains handed out life vests to the men. When the life vests were gone, the four chaplains, without hesitation, each removed their own, and gave them out to the men, thus ensuring their own demise. The 8,000 chaplains of the U.S. military during World War II earned 2,453 high medals. Though none could receive the Medal of Honor because of its special qualifications, a medal was created as its equal specifically for the Four Chaplains. For this reason, February 3 is celebrated as Four Chaplains Day among military members and interfaith groups across the United States. The Sunday nearest is remembered as Four Chaplains Sunday.